For us, surfing is more than simply just a sport. We grew up by the sea, with the waves, with surfing being part of our lives from a very young age. Through our Planet Surf camps, we aim to share with you the exhilarating feeling of surfing and the positive surf spirit too. If you leave our surf school in Moliets already planning when you are going to surf next, then we’ve succeeded! At our surf school in Moliets you learn from the best. 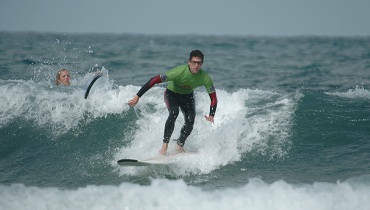 For us it’s vitally important that all our instructors are excellent surfers themselves. It’s much harder to teach someone how to surf well, if you don’t surf well yourself! Thus, we ensure that any instructor we employ firstly has excellent surf skills in the water themselves. Unfortunately, this is not guaranteed at all surf schools. Furthermore, not only are our instructors great at surfing, but they are great at teaching surfing too. It’s all very well being a great surfer, but if you don’t have the knowhow to transfer your skills to others, then you’re not much use as an instructor! Of course, all our instructors are fully trained and licenced, ensuring not only that your lesson programme is fun and effective in teaching you how to surf, but also that you are safe in the water too. At our surf school in Moliets, whilst you’ll also be educated in basic surf theory, the main and predominant focus is on practical experience. We ensure that right from your first lesson, you are taught the correct technique. We place a strong emphasis on technique to make sure that you don’t pick up bad habits, such as using your knees to stand up. Learning the right surfing technique from the start maximises your surfing progress. Asides from that you are safe in the water, our primary focus of our surf school is that you have fun! Our instructors have years of experience and are well versed in how to make learning to surf even more enjoyable. They know how to make sure you are completely at ease in the water and aren’t feeling nervous or scared. We want to share the joy of surfing with you at our surf school in Moliets!